Congratulations on getting married! 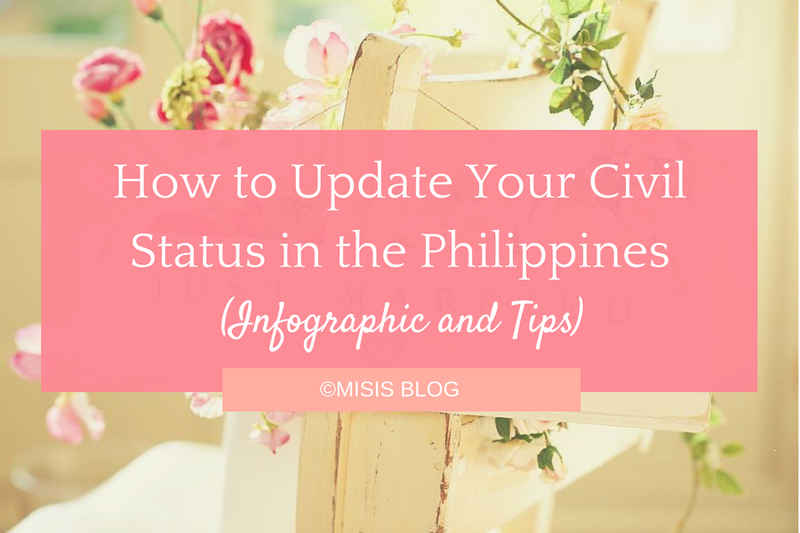 After all the wedding planning and the (on-going) honeymoon, it's time to get back to reality and face one of the "newly married life" hurdle: updating your civil status. Here's a simple guide on how to update your civil status in the Philippines, and if you're a woman, how to change your last name. Go to your nearest government office, or you can go to the nearest Government Satellite Office in SM or Robinsons. Ask for the corresponding form for information update. For SSS and PhilHealth, information update is effective immediately. For PAG-IBIG, information update is effective after 20 working days. Local Civil Registrar (LCR) Marriage Certificate is available after 15 working days from date of marriage. If you got married in a church, you can get your certificate from the parish office. National Statistics Office (NSO) Marriage Certificate is available 6 to 12 months from date of marriage. Since BIR requires an NSO copy of your certificate, your tax exemption update will take some time to file. You may opt to have your NSO Marriage Certificate electronically endorsed to expedite the process. You can get your certificate within 3 to 4 weeks. For more information, go to your nearest Philippine Statistics Office and bring a copy of your LCR Marriage Certificate. Tax Update is facilitated by your employer if you're employed.